New Bright, who boasts of being “the world’s leading manufacturer of Radio Control vehicles” offers a massive collection of radio controlled vehicles of all shapes and sizes but their new (and exclusive) 2014 Chevrolet Corvette Stingray Coupe could very well be the one that gains the company the most attention to date. We are sure to see an endless array of 2014 Corvette Stingray toys hit the market over the next few years but the folks from New Bright appear to be the first company to get a C7 Stingray toy to market. 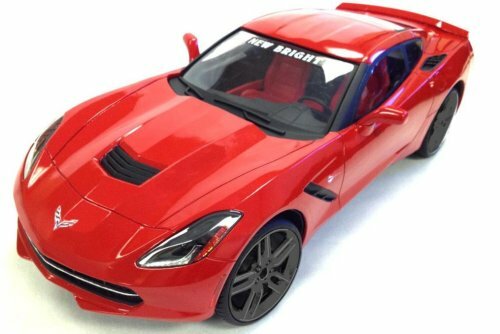 While New Bright offers some traditional fun, affordable RC cars including the Dodge Challenger, the Ford Mustang, the Chevrolet Camaro and the Chevrolet Corvette C6R, the new 2014 Corvette Stingray piece appears in pictures to be their most detailed – and likely one of the most detailed RC cars on the market. While many RC cars are simply solid composite bodies over an intricate chassis that carries and drivetrain, the New Bright C7 Corvette Stingray Coupe goes so far as to include working LED headlights and a fully detailed, realistic interior. On the outside, the New Bright 2014 Chevrolet Corvette Stingray appears to be fully identical to the car that helped introduce the world to the C7 Corvette in Detroit last month. This includes the bright Torch Red exterior paint, the dark split spoke wheels and contrasting rear differential cooling duct on the quarter panel that are both part of the Z51 package and the two tone red and black interior layout. Based on how detailed the New Bright 2014 Chevrolet Corvette Stingray looks in the available pictures, the fact that it looks just like the “debut car” and the fact that this is the very first example of the 2014 C7 Stingray, New Bright will surely have a popular collectable on their hands. Unfortunately, the company is not sure when their Corvette Stingray Coupe will hit shelves nor have they stated the price of this new RC Corvette. New Bright products are typically less expensive than some of the pricey “hobby shop brands” like Traxxas with store prices for their larger models (usually 1/10h scale) running in the area of $100 US Dollars. However, the exclusivity combined with the level of detail inside and out could make this one of their more expensive models. Regardless of how expensive the New Bright 2014 Corvette Stingray is when it hits shelves later this year, I would be willing to bet that it will be a hot product that wont be easy to get without bidding on the internet.